The first potentially big warm weather meteor shower is coming this weekend. Predictions of the peak’s timing all place the peak during daylight in the Midwest on the 22, but this shower usually has an extended peak. In fact, you may see as many meteors on the 21 or 23. The Lyrids are an irregular shower, usually producing a mere 10 – 20 meteors per hour, but occasionally reaching rates of around 100 meteors per hour. This year is expected to be a pretty average year, which means waiting several minutes between meteors. If you don’t have dark skies, it may mean 10 – 15 minutes between bright meteors. Posted by aquillam in MichiganAstro, Urban Observing. October begins the most active time of year for meteor showers. While few individual showers are as active as August’s Perseids, several overlapping showers make fall a great time to bundle up and get outside. The showers actually started at the end of September with the southern Taurids. This is a low activity shower, so you’ll barely notice it’s active. However, it’s especially good for southern sky watchers, and a lot of its meteors are fireballs. It doesn’t have a district peak, but remains active in to early November. Next up are the Orionids. They are active early October to mid November, with a peak on October 21-22. Most years this is a moderately active shower with about 20 meteors per hour. In some years it’s very active, with rates comproble to the Perseids, but at this time we don’t know how to predict if it’s an average or better than average year. Check the AMS weekly blog for the most current predictions. Finally the Northern Taurids are a close cousin to the Southern Taurids. Like the Southern Taurids, this is an extended shower with a low rate but a high number of fireballs. It is active from mid October to early December. If you prefer to listen to meteor showers, check out the Draconids. Because of its position in the sky, the best time to observe these is actually late afternoon and early evening. That makes this a great shower to try out the radio observation techniques. Full October 26 – this is the last “super moon” of the year. Morning planet watchers are in for several treats this month. 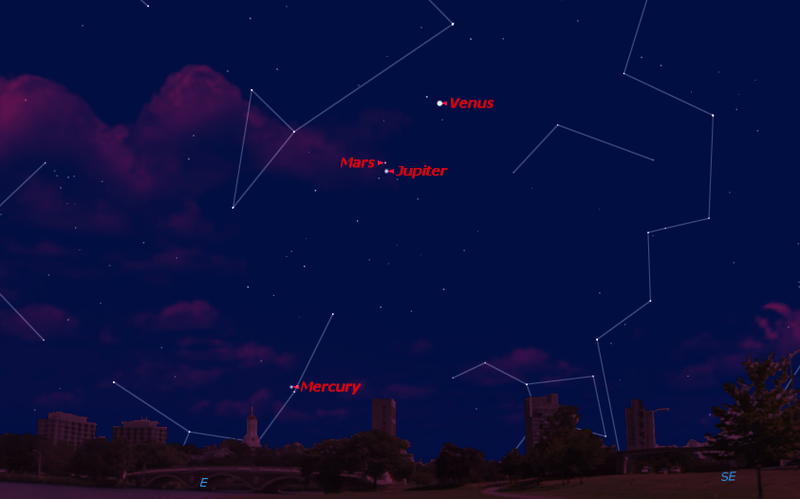 Even if you aren’t normally in early riser, you may want to get up on October 28 for a rare three planet conjunction. 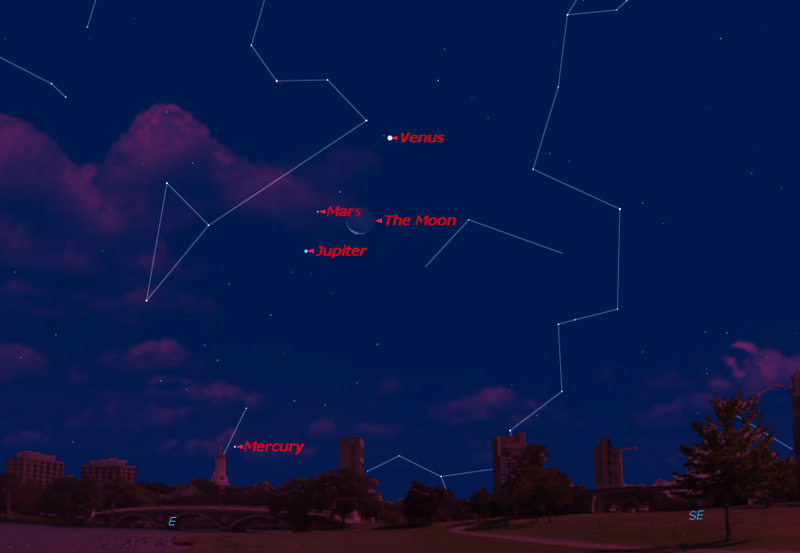 Mars, Venus, and Jupiter will all be within 1° of each other on that morning. Three planets in a very short line on October 28. 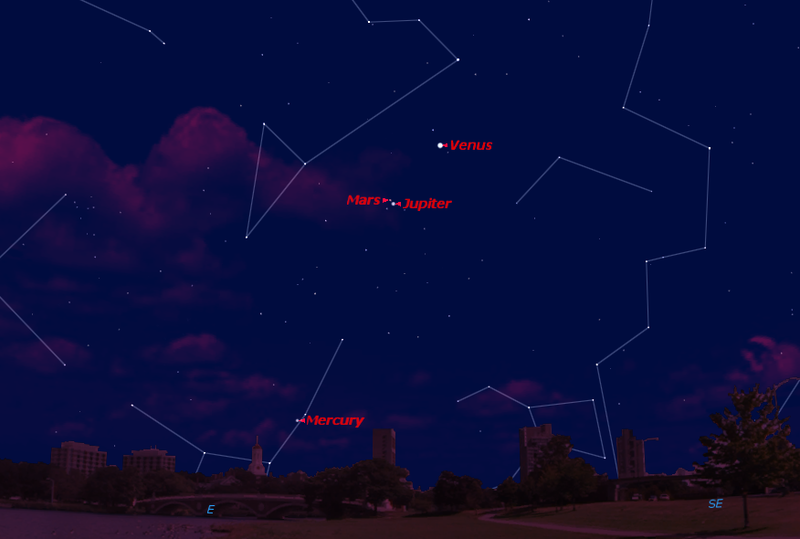 Mercury reaches greatest Western Elongation on October 16, so the second and third week in October should be a great time to observe Mercury in the morning. 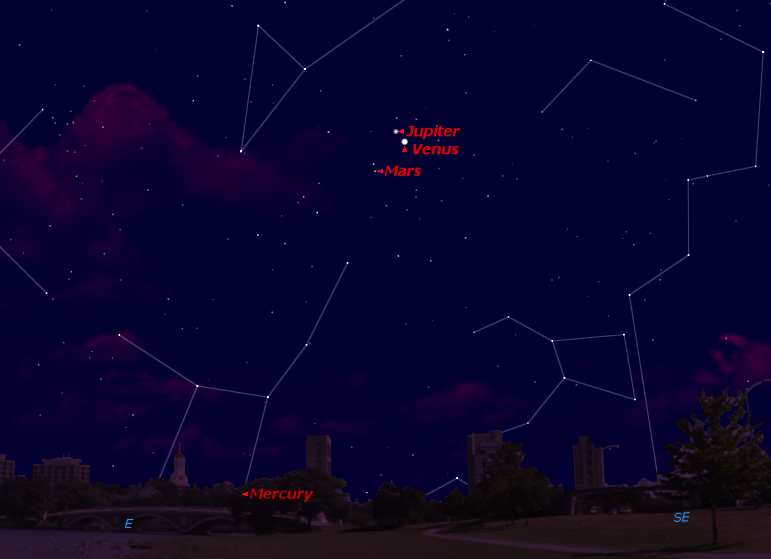 Mercury at greatest elongation about an hour before sunrise on October 16. Venus reaches greatest western elongation on October 26. It will be a good morning object for the rest of the year. However, it’s approaching a new Venus, so although it’s getting closer to us, it’s actually getting dimmer as well. It makes a tight group with Regulus and the Moon on October 8. A line of planets before dawn on Oct. 8. Mars is overshadowed by the other brilliant morning planets. A thin crescent Moon passes it on October 9. It is less than half a degree from Jupiter on the 17. The Moon passes Mars on the morning of Oct 9. 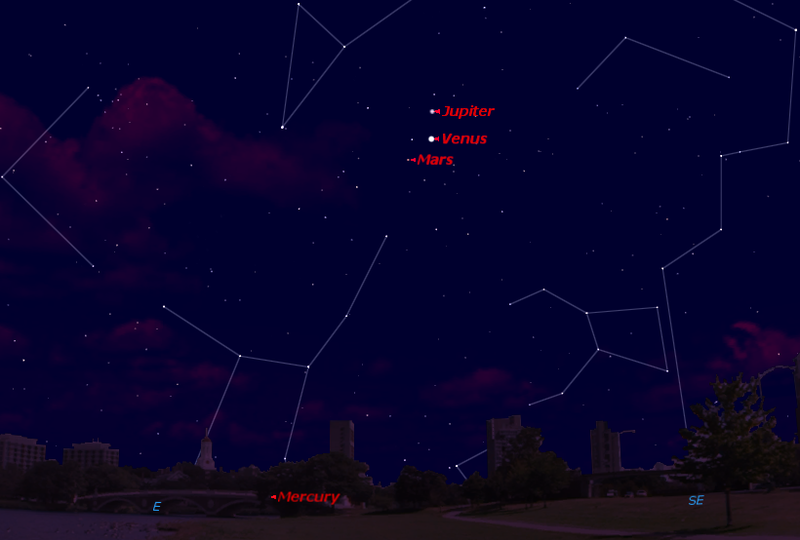 Jupiter has fully emerged into the morning skies by the beginning of the month. If it weren’t for Venus, it would be the jewel of the morning skies. Look for it in conjunction with Venus on the 26th. 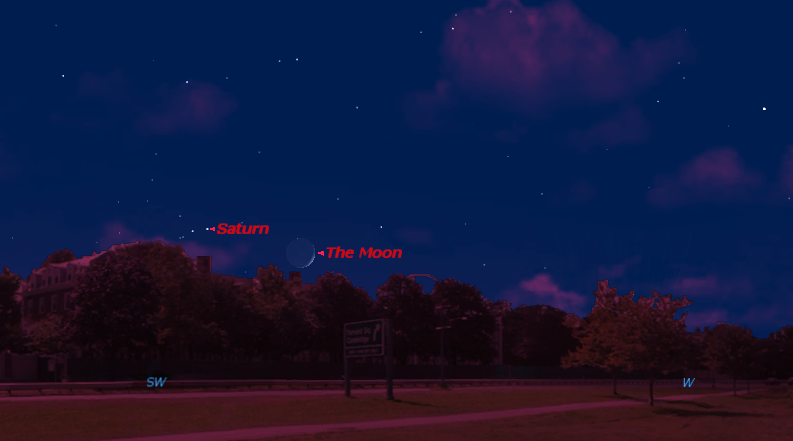 A trio of planets so close you can fit them all in binoculars just before dawn on October 26. Saturn quickly disappears into the evening twilight. 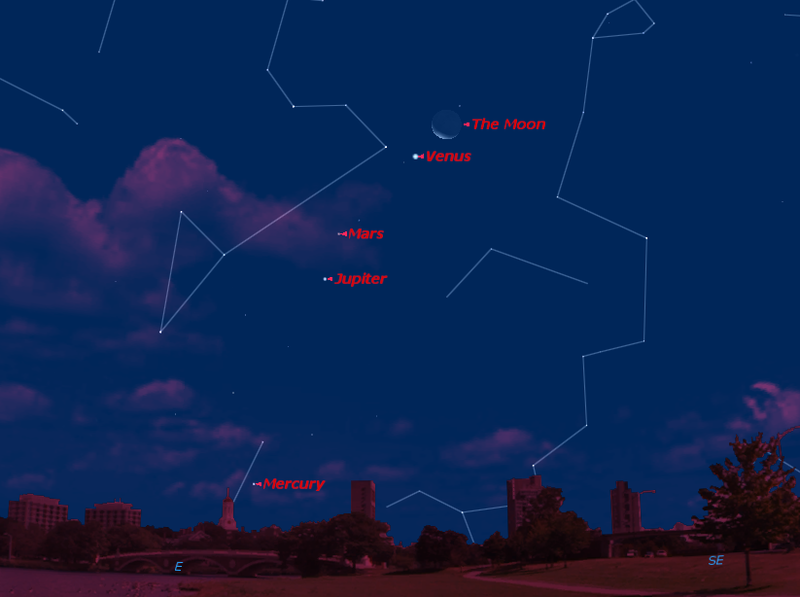 Look for it with a crescent Moon at sunset on October 15 & 16. 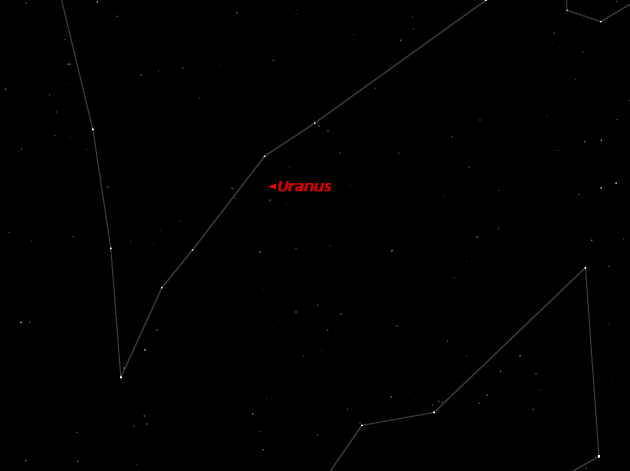 If you have a telescope, October will be a great time to look for Uranus. It reaches opposition on October 11. If you can get away from the urban lights, you might even be able to catch it naked eye. Uranus in the constellation of Pisces. Join Your Local Astronomy Club | Wired Cosmos. Personally, I think the Great Lakes Association of Astronomy Clubs is missing, but this is generally a good list of large amateur astronomy organizations. If you’re looking or help, thinking of getting started in the hobby, or ready to expand, these are all great places to start!